If you are fleeing persecution by the Chinese Communist thug government in the P.R.C. and seek asylum in the United States, I can help you. If you are charged with DUI in California, I can also help you. But loads of other attorneys can do these things. It's OK by me if you hire them instead. If, on the other fingers, you want to learn clawhammer guitar, old time banjo, or "how to have a better life with the music" I am your guy. In addition to teaching at music camps around country, I am also available for individual intensives. Give me your undivided attention and I can help you to get where you want to be. Banjo or guitar. 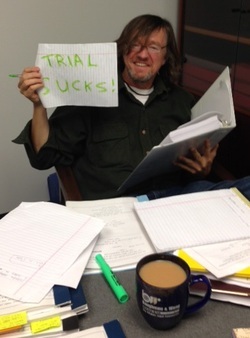 By the way, this photo was taken in my office as I was preparing for what I hope will be my last ever jury trial ever, ever. (I won, but it wasn't worth it.) If you are impressed by my name on the coffee mug, don't be. Anyone can have their name on a coffee mug. All you have to do is to pay for it. In this case it was a dumb idea. All I got out of it was a photo for my music website. Five hundred mugs, zero clients, but a music website photo. And I bet most folks didn't even notice the mug. Bad planning! Order your Baughman & Wang coffee mug here.